The job market is finally heating up in 2018. With all this new found trailblazing comes something else. Many people still get their health insurance through employers. When you leave an employer, your coverage generally goes with it. In 2018, there's a LOT of this going on. Many new employers have waiting periods for their coverage. How do we address this break in coverage in 2018. Short term health insurance has seen a huge uptick in 2018. Before you know it, we'll have to jump to the 2019 short term health review. We've had short term health plans for a long time. So...what's different under the hood in 2018? The core product is relatively the same. It's more catastrophic coverage to cover short periods of time. We'll cover both of these in-depth but here's the skinny of it. California banned short term health insurance plans eff 9/1/2018 so we only have AlieraCare health sharing plans which you can quote here. Read below on the companies available in 2018. Secondly, it's the time we're allowed. In his final year of office, Obama passed an executive action that restricted short term health plans to 3 months. We'll touch base on this below as well and see how the carriers have partially navigated around that restriction. Let's start with that piece first. This is one of the big changes in 2018. We used to be able to get short term health plans for 364 days (just shy of one year). We were then limited to a 3 months maximum. 30 days is the minimum amount of short term you can get in 2018. You can cancel month to month essentially. 90 days was the max but we now have a new option in 2018. Both IHC and UnitedOne have rolled out their 2 x 3 options. This essentially means we can apply for 2 consecutive blocks of 90 days (3 months). We can basically stack them with one application. Remember, you can still cancel month to month. Even if you apply for the 2 x 3 (up to 180 days), you cancel during any 30 day block. We just need to notify the carrier before the next 30 day block starts by email. There's talk that Congress might expand short term back to 364 days but we don't have that yet. Officially, we still have the tax penalty for not having health insurance in 2018. 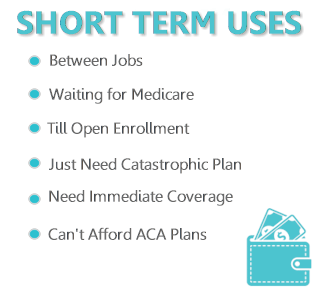 Short term does not meet the requirements of the ACA law so there is a penalty. But wait...we have a loop hole. Built into the law, you're allowed one exemption up to 3 consecutive months. That's where the original 2018 90 day restriction mentioned above comes from. The 2018 tax penalty is pro-rated by month. If we have short term for a 90 day block between other ACA health coverage (say through an employer), we can request the exemption. Even if we have no ACA plans (too expensive, etc) and get blocks of short term, we can still request the 90 day exemption. We're looking a 9/12ths of the penalty in that case. We're happy to walk through how this works with you. Just call us at 800-320-6269 or email us. We have an entire article on 2018 short term versus Cobra here but some quick points. You generally have 60 days from last date of coverage to "opt in"
More info on Cobra here. Short term generally works when we're pretty sure new coverage is around the bend. For a lot of people, it's not even a question. The Cobra is too expensive and they can't afford it. Short term becomes the default issue. Unless they're eligible for Obamacare or Covered California. Let's look at that next. This is the bigger decision. We have an entire article on Obamacare or Covered California versus short term in 2018. You should go with Obamacare. Even if it's for a short period of time. The tax credit will likely bring the cost down to what short term coverage or better. The benefits will be more comprehensive. Where we see people take short term is when they don't qualify for a tax credit or really just want to cover a short period of time till new coverage starts. You can also quote 2018 short term plans here. We're happy to help you compare the two options. There's no cost for our assistance at 800-320-6269 or by email. This is one area where things are different from prior years. Some States such as California, New York, and New Jersey have banned short term health plans. We now only have AlieraCare health sharing InterimCare plan. There are other some plans out there which we go out of our way to avoid. They'll have serious holes in coverage such as per day hospital caps on benefits. Why have coverage at all! The two above are the legitimate options for 2018 short term health. One note...they're not available everywhere. In California, we only have AlieraCare health sharing InterimCare plan. What if you have the option of both? Luckily, the two short term plans are pretty comparable. Short term is really designed to address more catastrophic issues and they both do this well. The networks are also comparable in 2018 for both carriers. It may be a simple as which one you have available in your state. In many States, we only have one of the two short term carriers in 2018. 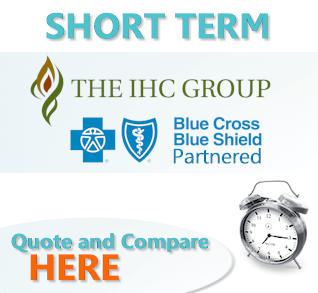 You can run your 2018 IHC short term quote here. You can run your 2018 UnitedOne short term quote here. You can run your 2018 AlieraCare short term quote here. Both carriers offer add-on plans to the core short term coverage such as accidental health, critical illness, telemedicine, etc. The system will automatically tell you if plans are available based on your income. 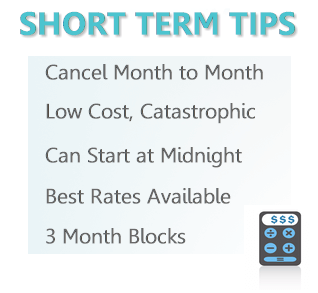 The common uses for short term in 2018 are the same as any year. The big difference is the new restrictions on how long you can have short term. Many people miss open enrollment or lose their coverage due to missing a payment. They essentially want to get coverage till Jan 1st when new coverage can start. At first, we only had 3 month blocks we could get. You could get additional coverage but you would have to re-enroll (based on health). Now in 2018, we can get 2 x 3 with either carrier. Essentially up to 180 days (can still cancel month to month). You can re-apply after that 180 days but subject to health. We're one of the biggest agents for short term health insurance in 2018. We do a lot of it! Both carrier are pretty comparable in terms of the day to day process. Apples and apples, UnitedOne is probably a little stronger but still very comparable. Some people read online reviews from the carriers which tend to be questionably negative. When you're getting short term coverage, you're basically looking to cover a fixed period of time. Most people will hopefully not need the coverage at all. Of those that do, most are processed and they're on their way. The vast majority of clients never have an issue and never really think about it. It's not like a restaurant where you definitely have an opinion...good or bad. This tends to skew the online reviews to the far negative side. Our experience after enrolling 1000's of short term policies? We only deal with legitimate carriers. A percentage of our clients will have pretty big claims (ACL tears, broken arms, accidents, etc) and we haven't had any issues with the claims side on these. It's remarkably smooth considering the sheer volume of 2018 short term we write. The plans are simple to quote in that you're basically choosing a deductible and co-insurance amount. We can help with any questions at 800-320-6269 or by email. There's no cost for our assistance. Enrollment is also easy and online. Short term enrollment for 2018 plans is simplified. Just a few health questions. If we can answer yes, we generally get approved. It depends on a person's situation, but for many people, it does. 2018 brought some changes to the market especially on how long we're able to have short term but the core needs are the same. Those are the main uses of it in 2018. We expect much of the same in 2019 with maybe an explanation on how long we can keep short term. We'll update the information for 2019 as we get there. Always new changes in health insurance! 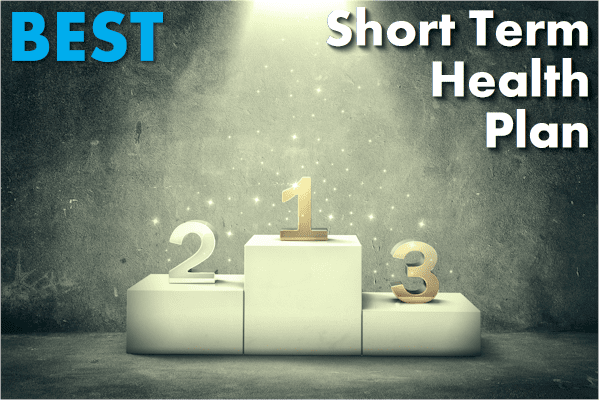 You can run your 2018 Short term health plan Quote here to view rates and plans side by side from the major carriers...Free.